Written by Catherine Saxelby on Wednesday, 13 January 2010. Stevia is a new sweetener that extracted from a plant yet has no kilojoules/calories, does not increase blood glucose levels and does not cause tooth decay. It is 250 to 300 times sweeter than cane sugar but tastes similar - certainly better than the older sweeteners like saccharin or cyclamate with their bitter metallic after-taste. It appeals to consumers who're after a more ‘natural' sweetener than aspartame or acesulfame-K which are often regarded as ‘chemical' with rumors circulating about their safety. It is available as a white powder or mini-tablets for tea or coffee, or as spoon-for-spoon granules for cooking. It works well in beverages or yoghurts but not in biscuits or muffins as it can't duplicate sugar's ability to add bulk and contribute to the golden-brown colour of baked goods. Derived from the leaves of Stevia rebaudiana, a semi-tropical plant common in Paraguay and Brazil where for hundreds of years, it has been valued for its sweetening properties and called ‘honey leaf' or Yerba Dulce meaning ‘sweet herb'. See my shot of it below. In old texts, it was often referred to as the 'sweetest plant of the world'. Native Americans would make up a ‘mate' herbal tea by picking the sweet leaves and simmering them in a pot. Or the leaves could be dried and used later. Two tablespoons of crushed dried leaves can replace a cup of sugar, although it's hard to be accurate as the sweetness can vary. You need around 10kg of stevia leaf to obtain one kg stevia leaf extract powder. Stevia has been used in Japan, Korea and China since the 1970s to sweeten confectionery and beverages (Japant has over 50 per cent of the commercial market and consumes approx 90 per cent of the world's supply of stevia leaves). The stevia leaf itself is 30 times sweeter than cane sugar but contains no kilojoules/calories. It was first described botanically in 1899 by Dr M S Bertoni. But it was not until the 1970s that the Japanese developed a method of extracting and refining the sweet glycosides out of the stevia leaf, creating a new product called stevioside which is 250 to 300 times sweeter than sugar (you'll find this also called stevia leaf extract or rebaudioside A or reb A). Stevia's glycosides do not raise blood sugar levels, so stevia-sweetened drinks and desserts are suitable for anyone with diabetes. The human body does not metabolise the sweet glycosides and they pass through and are eliminated, so the body does not extract any kilojoules/calories. Along with its sweetness, there is also an after-taste with a slight liquorice flavour - one I did detect. 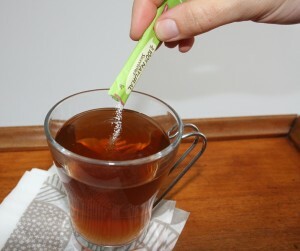 Read my side-by-side taste test of three stevia sweeteners and see how they compare. Stevia was approved for use in Australia in October 2008 and in Dec 2008 by the US FDA. How well it is accepted by consumers remains to be seen. Initially it is replacing sweeteners (like saccharin) in existing tabletop sweeteners (see picture above) and also replacing some of the sugar in diet drinks eg Pepsi Next, LiptonIce. One barrier to be overcome is its higher cost - stevia sweeteners are currently more expensive than other high-intensity sweeteners which is regarded as a major drawback by industry trendcasters. Look at these three examples available at the supermarket - tablets, sachets and powder. Find out what I wrote about the new diet drinks with stevia being launched in the US at the GI News Blogspot. There's one from Coca-Cola made with Truvia (Cargill) and another from Pepsico made with Purevia (Merisant). Australian Food News has a comprehensive summary of the latest news stories on stevia including from Europe and the US. Hear Catherine interviewed about stevia on ABC Radio National's 'First Bite' program with Michael McKenzie.